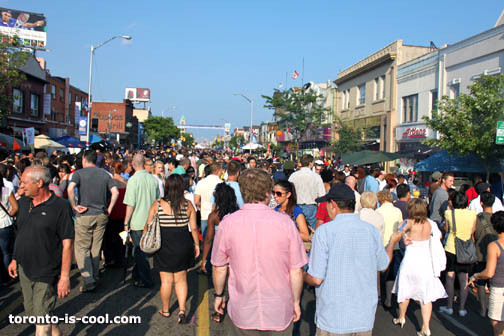 The Taste of Danforth is an Annual Food Festival in the Greektown area. Obviously, a Greek food feast is the highlight of the celebration since 1994. 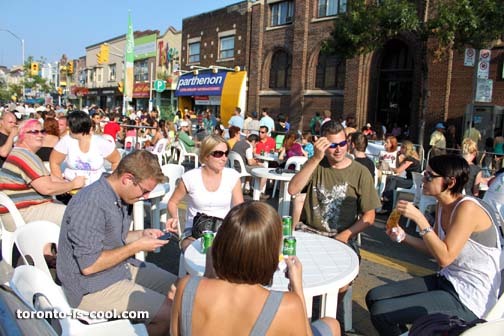 The feast happens between Chester and Jones Avenue on Danforth Avenue where majority of the sons and daughters of Zeus live here. Hundreds of Hellenic business are located here and this community is said to be the world's third largest Greek community after Greece and Melbourne, Australia. The three-day festival itself is the world's largest outside Greece. Directions / How to get there: Get off at either Donlands Subway Station or Chester Subway Station. Follow the crowd. 1. Greek Stage - This stage showcase Greek musicians and dancers. And yes, you can dance with them, too. 2. Celebrity Stage - This stage is a host to wonderful entertainers from the music to dance to performing arts industry. Expect live music with special appearances from invited popular guests. 3. The Broadview Stage - This area features lifestyle-related performances/music: from tango to flamenco to bellydancing and flash mob dance. 4. Beer, Wine and Spirits Garden - Thirsty? You know where to go. 5. Sports Zone - This zone features challenges of Toronto's well-loved sports: football, baseball, basketball, soccer and lacrosse. You don't just play or try it but also, win prizes! 6. Kids' Zone - Kids learn how to build the Acropolis, try on Hellenic art, dress like an ancient Greek God and goddess, and groove on Greek moves. 7. Food. Glorious Greek Food. Souvlaki, anyone? No? Yes? How about vasillopitta? Or saganaki? Hmmmnnn... You want a Greek salad, for sure! During the festivals, participating companies distribute hundreds of coupons and product samples. So, even if you are just curious to see the excitement about this festival, you will never go home without bringing anything.